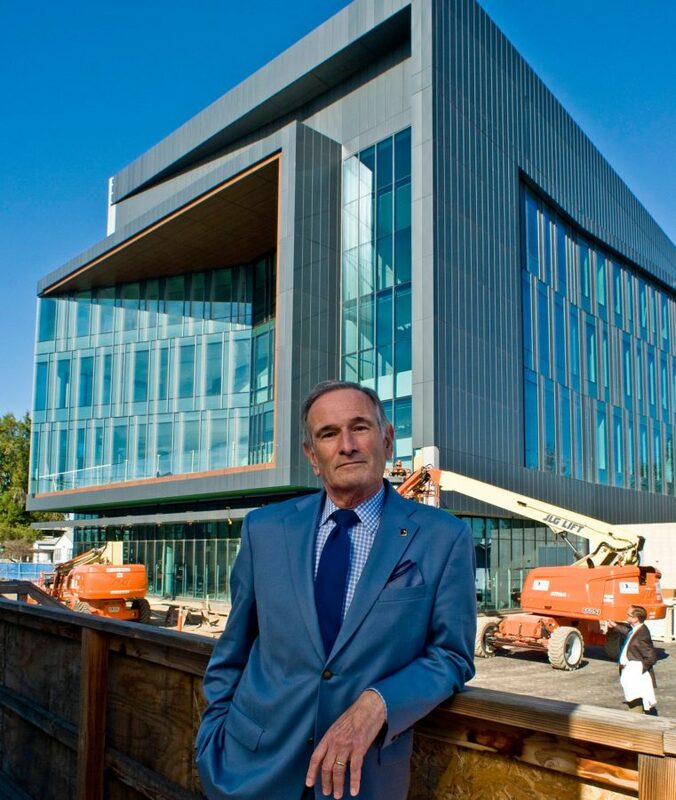 LABiomed CEO Dr. David Meyer in front of the new, $63 million LA BioMed MRL (Medical Research Laboratory). It is scheduled to be completed in March. Photo by David Fairchild (DavidFairchildStudio.com). Even in comparison to Elon Musk’s promise to colonize Mars and Patrick Soon Shiong’s promise to cure cancer, Dr. David Meyer’s goals for LA BioMed reveal an ambitious imagination. Like Musk and Soon Shiong, the LA BioMed CEO is that rare chimera of scientist and entrepreneur, but with none of his South Bay neighbors’ PT Barnum quirks. The 70-year-old, married, Peninsula father of two, cooks and makes furniture. He made the portable podium in his office. He wears blue blazers with gray slacks, white collared shirts and neckties. He bicycles around the hilly Peninsula for exercise. “The flat parts,” he quipped. Meyer’s pitch to investors and prospective researchers is a PowerPoint presentation, absent animation, that he narrates in a voice devoid of drama. The presentation begins with a 1943 photo of Quonset huts in an otherwise barren field in east Torrance that served as the Los Angeles Port of Embarkation Station Hospital. When World War II ended, some of the Quonset huts became Harbor General Hospital. Others served as offices and labs for the hospital’s 11.5 acre research facility, founded in 1952 and named, in ‘50s Eisenhower vernacular, the Attending Staff Association. The name changed to the Research and Education Institute, or REI as it was popularly known until 2004, when the institute was rebranded as the Los Angeles Biomedical Research Institute, or LA BioMed. But it was still in quonset huts. A 2010 National Institute of Health building grant application described LA BioMed as “functional, but ugly as sin.” The grant application was successful and in 2013 a new, $10 million Chronic Diseases Clinical Research Center replaced some of the quonset huts. Still more, but not all of the quonset huts will be replaced this coming March with the opening of the LA BioMed MRL (Medical Research Laboratory), a four story $63 million, 78,000 sq. ft., glass-clad building designed by architects ZGF, whose other current projects include renovating the 300,000 sq. ft. Spruce Goose hangar in Playa Vista for Google. Between images of the first quonset huts and the new MRL building, Meyer’s PowerPoint presentation recounts LA BioMed’s medical breakthroughs and lays out a new business plan that matches the medical achievements in ambition and imagination. Instead of a single focus common to most medical research centers, such as the Cedar Sinai Heart Institute, and St. Jude’s Children’s Research Hospital, LA BioMed’s over 100 researchers study whatever diseases intrigued them during their rounds at the adjacent Harbor UCLA Hospital. Meyer calls it “bedside to bench” research. In 1969, when LA BioMed researcher John Michael Criley, MD, of Palos Verdes, saw heart attack victims dying enroute to the hospital, he taught Los Angeles firefighters how to restart their hearts. “Emergency,” a 1970s television show based on the firefighters, called them paramedics, a take-off on paralegals. The show popularized paramedic training throughout the world. Also in 1969, LA BioMed researchers obtained a federal grant to train the first nurse practitioners. Nurse practitioners now bring medical care to underserved areas throughout the world. In 1970, LA BioMed’s Dr. Paul Fu Sr. introduced the cholesterol blood test that is still in use today. In 1963, the nation mourned when Jacqueline and President John Kennedy lost their fourth child Patrick two days after his birth to Infant Respiratory Distress Syndrome. In 1980 LA BioMed’s Dr. Alan Jobe developed a lung medication that has since saved tens of millions of infants from Patrick Kennedy’s fate. In 1990, LA BioMed researcher Sherwin Isenberg discovered that the costly silver nitrate eye drops doctors were required by law to administer to newborns did not, as intended, prevent venereal disease infections. But Povidone Iodine drops did. And the costs for five doses was one cent. Isenberg’s eye drops have saved an estimated 500,000 children worldwide from blindness. Also in the 1990s, LA BioMed’s Dr. Yutaka Niihara’s anguished over the pain he saw in children with sickle cell disease launched him on a 14-year quest for a treatment. His discovery remains the only FDA approved treatment for children with Sickle Cell disease, which afflicts 25 million, worldwide. One in 2,000 infants are afflicted and sometimes die from Long QT syndrome (LQTS) . This year, LA BioMed researcher Ruey-Kang Chang received FDA approval for a, small, disposable Electrocardiogram (ECG) device that resembles a flexible circuit board. It replaces the jumble of wires of traditional ECG devices so parents can use it at home. The device identifies congenital or inherited heart disorders and wirelessly transmits its findings to the infant’s physician. An adult version is available for sports team physicians and adults with heart disorders. “Physicians don’t carry black bags now. But if they did, those bags would be filled with LA Biomed discoveries,” Meyer said. LABioMed may have left the black bag days behind. But it’s finances were still in the Quonset Hut era. LA BioMed lost $1 million on revenues of $72 million in 2009, the year preceding Meyer’s arrival. Meyer’s parents fled Berlin for the U.S. in 1941. “The alternatives were to go underground or to the camps,” Meyer said. They settled near downtown Los Angeles. Meyer attended John Burrougs, Jr. High and Los Angeles High School. During his senior year he was accepted into a gifted students program at UCLA, where he would receive undergraduate and doctorate degrees in biology. He helped pay his way through college by working as an electrician’s apprentice for a company that built Los Angeles Unified schools. After UCLA, Meyer received postdoctoral study offers from Princeton and the University of Basel. “I’m thinking to myself, hmmmm, New Jersey or Switzerland? There was not a lot of discussion there,” he recalled. He planned to stay in Europe two years. He stayed 13 years. Though his parents spoke German with their friends, and he studied German at UCLA, it was of little help in Basil, where he taught biochemistry. The Swiss speak Swiss German, which he described as closer to Alsatian and Yiddish than German. His German language skills did prove useful when he moved after five years, to Heidelberg to serve as a research group leader in cell biology and dean of graduate studies at the newly opened European Molecular Biology Laboratory. “EMBL was funded by 10 European countries with the idea of giving young scientists a sort of sandbox to work in for five to 10 years to build up their careers and then go back to their home countries,” he said. Four decades later that model would inform his vision for LA BioMed. Meyer returned to UCLA, to its David Geffen School of Medicine in 1987, a decision strongly influenced by his Swiss-born wife Evi. “I had offers from Columbia University Medical Center in Spanish Harlem, Johns Hopkins University in Baltimore and UCLA in Westwood. Evi said Westwood,” Meyer recalled. In 1999, the couple moved from the Hollywood Hills to Palos Verdes Estates for the schools. Their son Daniel and daughter Susana attended Palos Verdes Intermediate and Palos Verdes High. Evi is a biologist at the Cabrillo Aquarium. Meyer’s UCLA research in cellular membranes led to discoveries of four new human proteins and cover stories in the “one word journals” Nature, Science and Cell. “So, what if there are 20,000 human proteins. For one research group to discover four of them was a lot of fun,” Meyer deadpanned. Because of his college-years electrician apprenticeship and fondness for woodwork, Meyer was “roped” into managing the renovation of 1.5 million sq. ft. of UCLA Medical School lab space and subsequently working on the design for the Gonda (Goldschmied) Neuroscience and Genetics Research Center. “I can read blueprints and understand wiring, something most scientist can’t do,” Meyer said, with no hint of irony. 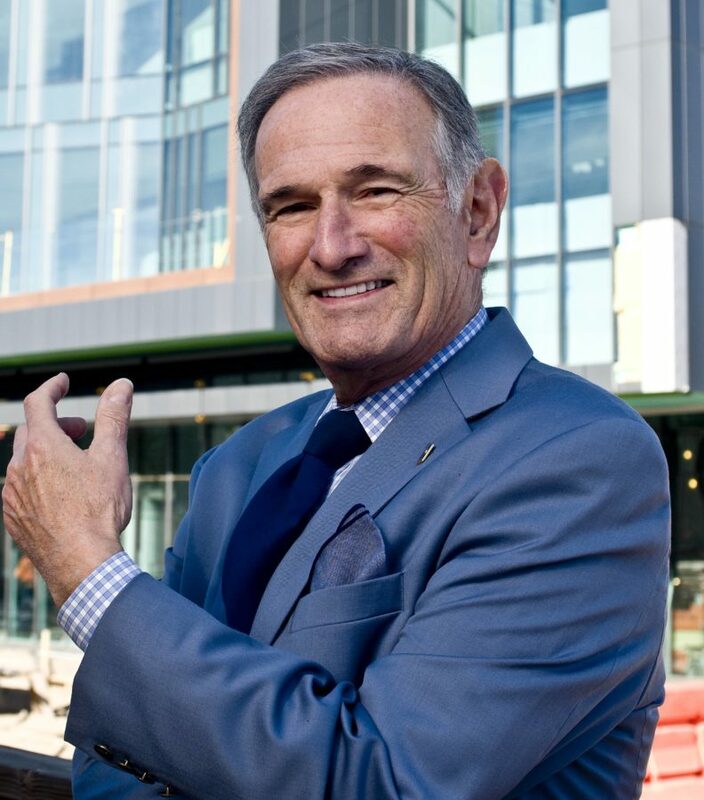 His construction skills, his medical research, plus the administrative and grant writing skills he acquired as Senior Dean of Graduate studies at UCLA led to his recruitment by LA BioMed to be its CEO in 2010. At the time he was at the House Ear Institute. He had retired from UCLA, after 18 years, as professor emeritus in 2005. He said he doesn’t miss the Eureka moments that come with scientific discoveries. “I’m finding it more satisfying trying to facilitate a bunch of research, rather than just my own and my team’s,” he said. Much of LA BioMed’s research focuses on genetics. Why the high rates of diabetes among Hispanic women, glaucoma among African Americans, strokes among Asians and Alzheimer among caucasians? Meyer asks rhetorically during his PowerPoint presentation. “Because over 50 percent of common diseases are gene related,” Meyer said. Twenty of these diseases, ranging from Atherosclerosis to Osteoporosis are currently being studied at LA BioMed. “You’re a healthy 22-year-old. But a genetic analysis of your blood sample indicates an 80 percent likelihood of prostate cancer by time you’re 60. We’re working on a treatment to reduce that likelihood to five percent,” Meyer said. The controversial field requires proceeding cautiously, he noted. “Modifying cells to correct a deficiency is worth pursuing. If embryos can be safely selected for ‘preimplantation’ to eliminate a heritable ailment, that is also good. But at this point, attempting to target defects in human embryos is a bad idea because ‘off-target’ alterations can result that would do more harm than good,” he said. In his PowerPoint presentation Precision Medicine is followed not by another medical breakthrough, but by a financial roadmap to future breakthroughs. “The Future LA BioMed Paradigm” is Meyer’s business plan. The seven step outline begins at bedside with a diagnosis and ends at bedside with treatment. Along the way “bench” work leads to discovery of a treatment and then the LA BioMed Business Development and Technology Transfer Committee steps in. The committee of scientists and financial experts helps secure intellectual property rights, and establish start-ups that are to be nurtured in the new Medical Research Laboratory’s, level III (for third floor) biotech incubator. When the startup is healthy enough to leave the incubator, it will move across campus to the new 15-acre BioCenter tech park, which received Los Angeles County approval last year and is scheduled to break ground in 2020. Los Angeles County Supervisor Mark Ridley-Thomas, who helped secure a $50 million bond to finance the new Medical Research Laboratory, is also helping spearhead the new tech park. “Research, incubator, tech park. We’ll be able to offer all of this on our campus. It will be the first bioscience hub in Los Angeles, if not the nation,” Meyer said. The $6 million level III biomedical incubator is being funded by Los Angeles County and Richard and Melanie Lundquist, of Palos Verdes. Its 18,000 sq. ft will have lab, office space for 30 start-ups and 75 “knee holes,” a term of art for the six-foot-wide work areas typically assigned to researchers. Preference will be given to, but not limited to LA BioMed researchers, Meyer said. “Of the science start-ups that are still around after five years, 85 percent were developed in incubators. In Los Angeles, there are presently only nine science incubators,” Meyer noted. There is a similar shortage of lab space for bioscience startups, he added in explaining the need for the tech park. Promising discoveries that lack startup capital get it from LA BioMed in exchange for equity. Over the past dozen years, LABioMed has helped launch 13 biomedical startups. Among them are Aldurazyme and Kybella, which LABioMed licensed to start-ups. Aldurazyme was developed by LA BioMed researcher Dr. Emil Kakkis in 1999 to treat the often fatal, genetic disease Mucopolysaccharidosis, which causes waste build-up in cells. In 2016 and 2017, LA BioMed received $11 million in royalties from Aldurazyme. In 2015, Kybella received FDA approval for an injection treatment developed by LA BioMed’s Dr. Michael Kolodney and a UCLA collaborator to treat benign tumors. That same year pharmaceutical giant Allergan acquired the rights to Kybella for $2.1 billion. LA BioMed received $39 million for its interest in the drug and approximately $20 million more in other royalties in 2016 and 2017. In addition to treating benign tumors, Kybella shrinks submental fullness in men, commonly known double chins. The final pages of Meyer’s PowerPoint presentation are devoted to LA BioMed’s new doctoral program in Translational Research. “There were no programs, at least in the U.S. that train scientists to be entrepreneurs, to convert their discoveries into salable products,” Meyer said. He said he’s not encouraging scientists to divert their efforts away from science to pursue business. But neither does he want their discoveries lost in the lab. “They need to know enough about businesses to know what they can do and when they need to hire an experienced CEO,” he said. The first Translational Research class started this year with four medical graduates from MIT, Berkeley and Cal State Dominguez Hills. Complementing courses in genomics, metabolic diseases and cancer are courses in intellectual property, FDA regulations and start-ups, spinoffs and fundraising. Meyer described the program as analogus MBA for researchers. One notable development not mentioned in his 48 page PowerPoint presentation is a breakthrough that neither Musk nor Soon Shiong have achieved with their passion projects. Last year, LA BioMed turned a $16 million profit on $98 million in revenue, according to its 2017 financial statement. More impressive still, those profits are not distributed to shareholders. They are reinvested in research.